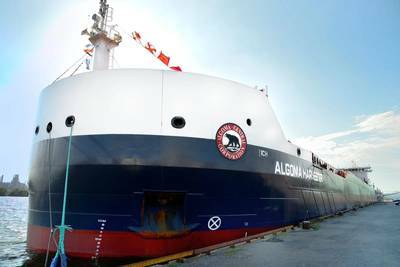 Algoma Central Corporation announces the arrival in Canada and the christening of its second Equinox Class bulk cargo vessel, the 'Algoma Harvester'. The christening took place at Pier 26 South in Hamilton Harbour before an audience that included local dignitaries and members of the marine industry. Mrs. Kathy Baske, wife of Jim Baske, the President and CEO of ArcelorMittal Dofasco imparted the traditional blessing. As is customary for these ceremonies, a bottle of champagne was broken against the bow of the ship, a banner revealing the ship's name was unveiled, and Father David Mulholland of the Mission to Seafarers offered prayers and other words of inspiration to the Canadian crew of the ship. Alogma explains that the Equinox-Class represents the next generation of Great Lakes - St. Lawrence Waterway bulk cargo vessels. The ships have been designed to optimize fuel efficiency and operating performance thus minimizing environmental impact. A 45% improvement in energy efficiency over Algoma's current fleet average is expected, resulting from the use of a modern Tier II compliant engine, increased cargo capacity, and an improved hull form. In addition, a fully integrated IMO approved exhaust gas scrubber will remove 97% of all sulphur oxides from shipboard emissions. Algoma is the first company to use an IMO approved integrated scrubber on a Great Lakes - St. Lawrence vessel class. "We have been extremely pleased with the performance of the first Equinox Class vessel, the Algoma Equinox, since she joined the Algoma fleet last November," said Greg Wight, President and CEO of Algoma. "We are also very pleased to host the Algoma Harvester christening in Hamilton today with our major customer, ArcelorMittal Dofasco. The Equinox Class bulkers have been designed to optimize performance in the movement of iron ore for companies like ArcelorMittal Dofasco and for the movement of grain products. We expect the ship to move 1 million tonnes per year of these commodities," Mr. Wight continued. Algoma took delivery of the Algoma Harvester on May 13th and the vessel departed from the shipyard in China on May 18th. The new vessel picked up its first load of cargo at Port Cartier, Quebec on July 11th, following a 54 day voyage across the Pacific and through the Panama Canal to get to Canada. The first cargo of iron ore, which has set a new record size, will be delivered to ArcelorMittal Dofasco in Hamilton immediately following the ceremony. The Algoma Harvester will serve primarily agricultural and iron and steel industry customers, making regular voyages from lakehead ports on Lake Superior such as Thunder Bay and Superior/Duluth to Port Cartier, Quebec City, and Baie Comeau in the St. Lawrence. In between, this maximum seaway-size bulker also visits other ports such as Contrecoeur, Hamilton, Toledo, Chicago, and Milwaukee during the course of a navigation season.